Tap-N-Zoom – SMART-reg International, Inc. The 2nd generation of our popular Tap-N-Go Session and Event Verification Scanning System! The next generation of our Tap-N-Gos, the Tap-N-Zoom provides all the benefits plus the ability for real-time access to this data. From seeing who’s in a particular event to providing the ability to download workshop-centric material, the Tap-N-Zooms are the most innovative, reliable, accurate and cost effective tracking device in the industry. Our access control scanners allow you to create a custom virtual ticketing and entry control, so whether you’re looking to monitor general session admission, grant individual access or anything else, we got it. 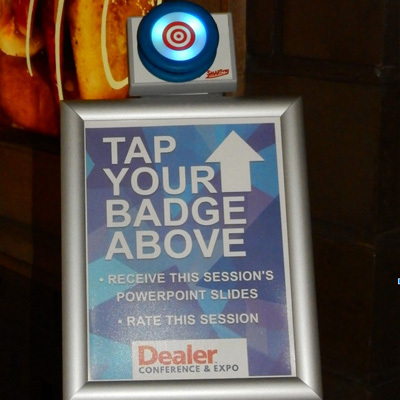 In addition to access management, our Tap-N-Zooms can track where attendees have been throughout the conference and exposition and when paired with our RFID badging and/or gamification platforms, that can award prizes, making your event’s attendance both fun and rewarding. The Tap-N-Zooms are portable, but require electricity. A secure WiFi ensures that the access and speed is not affected by outside variables (from onsite registration processing to public access to bandwidth). And, like the Tap-N-Gos, the Tap-N-Zooms are a highly sought after sponsorable item.